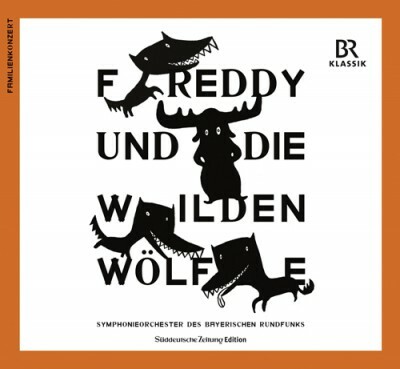 StartseiteHome BRSO Media Center CDs & DVDs Family Concert: "Freddy und die wilden Wölfe"
Family Concert: "Freddy und die wilden Wölfe"
It's winter and freezing. The wolves walk through the dark, snowy forest and they are hungry. They have a plan: they want to catch (and propably eat) the elk Freddy. Luckily Freddy is friends with the baby-wolf, even if that does not seem possible! Freddy once saved baby-wolf and this time baby-wolf wants to help the elk. When baby-wolf gets lost in the forest, the other wolves have to make a change of plans... The exciting and funny family concert of the Symphonieorchester des Bayerischen Rundfunks is now available on CD!